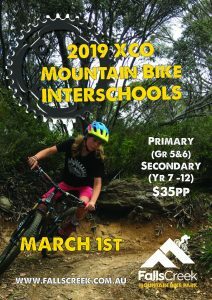 Falls Creek Mountain Bike Park in collaboration with Mount Beauty Secondary College, are hosting a 1-day mountain bike event for Secondary and Primary School aged children. This XCO – cross country Olympic event format race is suitable for beginners and experienced riders alike. The courses will be from 1.5km – 6.5km on road, off road & on single track. Students will loop the course multiple times and the fastest overall time wins. This event format is intentionally designed to introduce kids to a variety of mountain bike terrain. Winners will take home medallions and earn points for their schools. The highest scoring school will take home a Falls Creek Mountain Bike Park Champion School Perpetual Trophy.